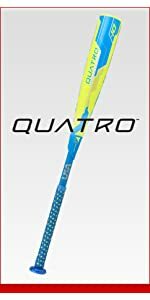 The “quatro” in the 2018 Rawlings Quatro -10 USA baseball bat model name refers to how the bat excels in terms of flex, balance, distance, and performance. It’s actually a well-known model, though of course this is the latest version which is one of the top 2019 USA bats. What’s important here is that this new version also complies with the new baseball bat standard that has been set up among numerous youth baseball leagues. So this is legal to use. But would the changes to the bat due to the new standards make it deserving of the affectionate “Glowstick” term that fans have used for it before. Does it make you feel like a Jedi warrior at the plate? Let’s find out with a closer look. Let’s start with the usual. This is a carbon alloy bat with a 2 5/8-inch barrel diameter, and a drop ratio of -10. It’s available in sizes ranging from 28 inches long (18 ounces) to 32 inches (22 ounces). What will strike at first glance, however, is how it looks. It sports a truly memorable combination of yellow and blue. The handle has a blue mesh pattern with yellow spots also peeking through. It’s absolutely striking, especially when you’re swinging it. It’s called the Glowstick for a reason. But what’s most important of all is that you can also clearly see the USA Bat label in the middle between the handle and the barrel. That’s what you need to show the umpire when you’re playing in a league that requires USABat-compliant baseball bats, like Little League. This gives you a clear idea that this is a legal bat to use, with no other questions asked. Its legality, however, is not the only reason why players will appreciate the 2018 Rawlings Quatro -10 USA baseball bat. This has a 2-piece design with a hinge system that gives you focused flex. So in a way the bat will flex upon contact with the ball. This gives you the pop you need when you want to get that ball out of the strike zone and into the field in a hurry. Then there’s the newly designed end cap at the tip of the bat. Since this is a bat with a drop -10, you can pick the weight of the bat that’s most ideal for you and you’ll find that the bat will give you and extended barrel length for greater plate coverage. The end cap reduces unneeded weight at the end of the barrel. The balanced swing weight is great for contact hitters. If you’re one of those, this will let you get the bat going more swiftly as you start your swing. The light weight and balanced weight distribution also gives you greater control over the bat. You can simply swing and it will go where you want it to go through the strike zone. As you swing, you also will appreciate the nice grip on the handle. It feels very comfortable, and it makes you feel secure enough that you know you won’t suddenly lose your grasp on the bat. You won’t even really need to use your batting gloves with it. The overall performance level of this bat is terrific. One advantage that you get with the Rawlings Quarto US8Q10 is that stinging vibrations won’t be a problem anymore. It has VDT (Vibration Dampening Technology), which is mainly the Quatro collar that’s been infused with silicone to absorb the vibrations before they sting your hands. This is made with 100% carbon fiber, and you can even see it with the “Tru-View Technology” that lets you see inside the bat. It’s made in the USA, and it’s tough. It comes with a 12-month warranty. There are many reasons for getting this bat, because it’s truly an outstanding bat for this new era of ISA Bat standards. This is a 2-piece bat with a separate barrel and handle. Yet in a way it’s also a 4-piece bat, since there’s the end cap along with a distinct collar piece between the barrel and the handle. Either way you view this, it isn’t a 1-piece bat like the Louisville Slugger Solo 618. It means there’s going to be lots of flex when you make contract with the ball. That flex really lets you swing through the strike zone even as you hit the baseball. The light weight of the bat also makes it easy to swing very quickly, and you can catch up to fastballs more easily. Also, you get greater plate coverage since you get an extended barrel. The end cap of this Rawlings baseball bat is specially designed to keep the weight distribution balanced throughout the length of the bat. The end cap gets rid of the extraneous weight, so what you have is a bat that’s much easier to control. You can basically make it go where you want to, even when you make a full swing. That’s obviously ideal for hitters. Since this bat will make it more likely that you will make contact with the pitch, it also fortunately addresses the issue of stinging vibrations. This is a notorious problem for 1-piece bats, and as a 2-piece bat it’s not as much of a problem. Part of the solution is the hi-tech collar between the barrel and the handle. It’s infused with silicone that absorbs the vibrations so there’s very little of it left when it does reach your hands. It looks cool as well, and for many young players this is always a crucial consideration. The striking yellow and blue color combination explains why it’s called the “Glowstick” especially when you take a swing. It even features the Tru View design that lets you see the carbon composition inside the barrel. Perhaps most important of them all—this is legal to use for Little League. Other leagues that have adopted the same bat standards include the AABC, Babe Ruth, Cal Ripken, Dixie Youth, and Pony Leagues. Of course, just because this 2018 Rawlings Quatro -10 USA baseball bat is ideal for many young hitters, it doesn’t mean that it’s perfect for everyone. After all, there may be some really strong youth players out there who are more like power hitters. That may mean a preference for an end-loaded bat, and this doesn’t have that weight distribution. Also, there’s the price. It’s not that it is overly expensive, but some parents may find it hard to buy this when there are other serviceable bats out there that come with much lower prices. Of course, most of those bats aren’t as good as this one, but then for some people they may be “good enough”. With this, it’s not about being good enough. It’s about being the best there is. The Rawlings Quatro has been a popular model for a while now, and this new version still deserves the Glowstick nickname. It’s not just because of how it looks, but also about how it performs. Rawlings took into account everything that a contact hitter may want, and then put in the features that addressed each issue. In many ways the 2018 Rawlings Quatro -10 USA is among the best legal bats to use in the various USA Bat leagues, and with this your hitting performance will reach optimal levels. You’ll even look cool as you swing! Want this 2018 Rawlings Quatro with Free shipping?